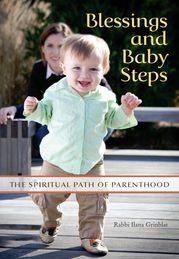 Rabbi Ilana Grinblat’s, “Blessings and Baby Steps: The Spiritual Path of Parenthood” recently published by Behrman House offers a refreshing account of one mother’s attempt to infuse Jewish values and education into her parenting. I can attest that her short chapters make reading the book possible — even when you are busy chasing your own small children. I read the book while my children were engaged in sand play — three minutes here, 15 minutes there. Also, the chapters are very topical, so readers will easily hop around to topics of interest. The collection of essays spans pregnancy through age four and touches on many poignant and real life parenting moments. Drawing on her rabbinic training and religious upbringing, she offers a decidedly Jewish take on many of the daily parenting struggles from sleepless nights through preschool and even swimming lessons. Many of the moments ring honest and true and she does a good job keeping her accounts grounded in the universal challenges that most parents face like dealing with separation and potty training. My favorite pieces are when she works in Jewish teachings that are new to me into her essays and draws on text from Torah, Talmud and Midrash as well as mentors she has met along the way. I think the strength of the book is in the descriptions of her experiences, the questions she raises and the unique ways she grounds them in Jewish texts. And as a fellow Jewish mother who works to imbue my own parenting with Jewish values, it is fun to read something that is so close to home. So, do you want to read it? I would love to offer a copy of this book to a blog reader. Leave a comment here if you are interested in reading it, and I will pick someone at random to win a copy. Also, in full disclosure, I was given a free copy by the publisher and I am so glad I was! I am definitely interested. I have been actually looking for a little more guidance about my parenting. Thanks. And the winner randomly selected by my son banging on the calcular is Sheri! Thanks all for entering hopefully we will have future giveaways. It sounds like a lovely inspirational book which would be a help to any parent. Thank you for the opportunity to win it.